These Farm Heroes level 210 cheats and tips will help you beat level 210 of Farm Heroes. 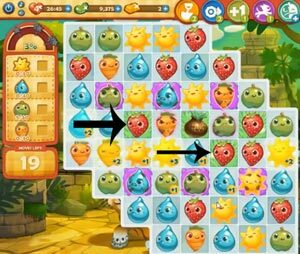 The objective of Farm Heroes level 210 is to collect40 suns,40 droplets,40 apples and40 carrots in 20 moves or less. This is a remarkably tricky level -20 moves can be frustrating even in the best of circumstances. As you can imagine, collecting 120 cropsies with only 20 moves is a nightmare. But don’t fret. Focus on the patches of grass, because they are your keys to the golden kingdom (also called passing the level). Grass will increase the value of your cropsies, maximizing the amount of cropsies collected with each match made. Stick near the grass for the entirety of the level if you want a painless gaming experience. The patches of grass will also make any grumpy cropsies happy, so you have more opportunity to make matches that will count toward your objectives. If the seed lines up where you need it, perfect. Use it to grow some more grass and this level will be infinitely easier. However, if it doesn’t land in the right place, don’t worry about it. You can’t afford to waste too many of your moves on relocating the seed. Alternatively, you can look to see where the seed is located before you make any moves, and if it isn’t in a prime area, simply exit the level! You can continue entering and exiting the level until you get a board layout where the seed is in an ideal spot where it can easily be turned into grass. Try not to make combinations with slimy cropsies unless you absolutely have to. They will diminish the impact of your matches and limit the amount of points you make. You can use the seeds to eliminate the slime from the board, which will make the level significantly easier if there are no additional grumpy cropsies being generated. 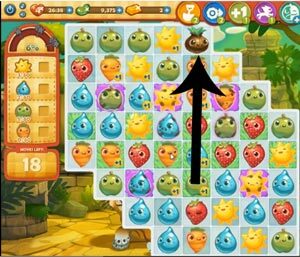 If you choose to do this, eliminate the slime on the top portion of the board first – because the board shifts downward, the slime squares lower on the board will not have as significant an impact on your gameplay. 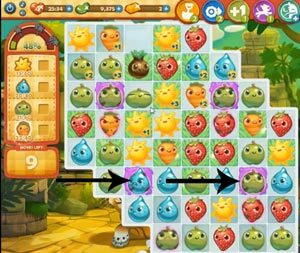 If you eliminate both slime squares on the top of the board, you can simply play from that half of the board and not have to worry about any grumpy cropsies whatsoever!